Cermak Avenue is a fascinating road. It begins at the convention center on the south edge of downtown, heading west. It forms one of the major arteries of Chinatown shortly thereafter, then becomes an industrial corridor south of Pilsen – and then a commercial strip that’s part of Pilsen. Then another mile or two west it becomes one of the two commercial spines of Little Village, then a residential boulevard. And then, a few miles further along, it marks the terminus of the Pink Line El – at which point it becomes one of Chicago’s most rewarding places for hunting Mid-Century commercial buildings. 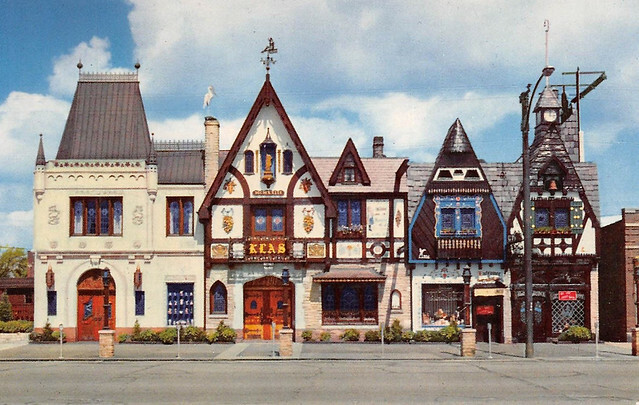 Then, apart from all that, there’s the Klas Restaurant. 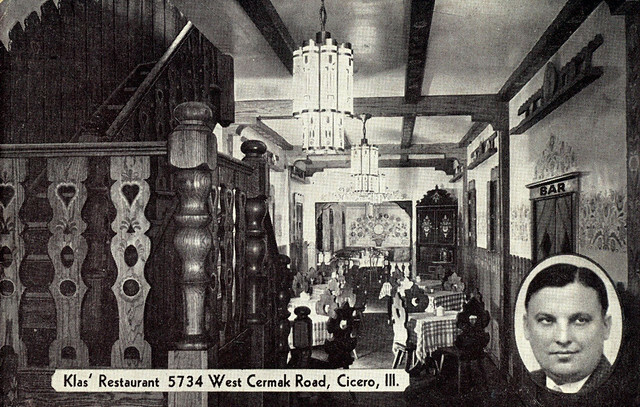 Standing at 5734 West Cermak Road in Cicero, Klas’ Restaurant would be an institution by virtue of its age alone, having been open since 1922. 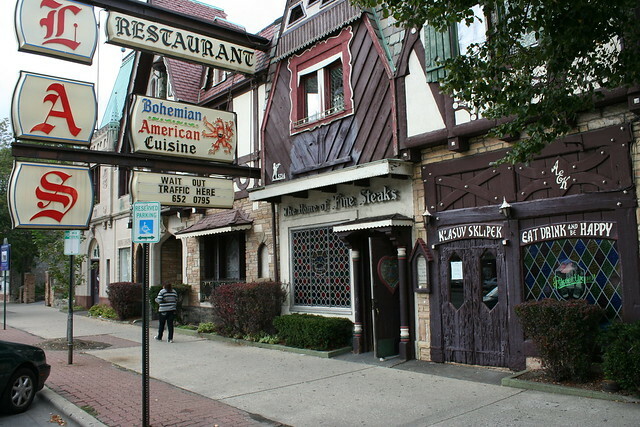 Founder Adoph Klas was a native of Bohemia, who established his Czech restaurant at a time when Cermak bustled with Eastern European immigrants, and was known as the “Bohemian Wall Street”. On a 1939 return trip to Czechoslovakia, Klas was reportedly imprisoned by the occupying German government, which prohibited the carrying of money out of its territories. No word on when or how he was freed. 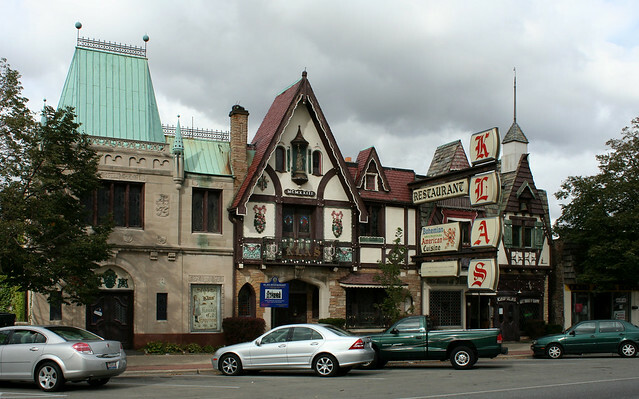 The elaborately decorated restaurant was a neighborhood fixture, hosting everything from 50th wedding anniversary parties and Dale Carnegie speaking courses to famed gangster Al Capone, who dined regularly on the second floor. 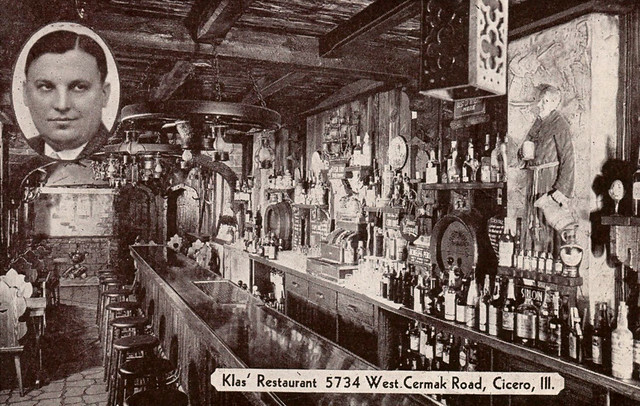 Klas passed away in 1962 but the restaurant has persisted. More recently, President George Bush (the elder) also dined there. 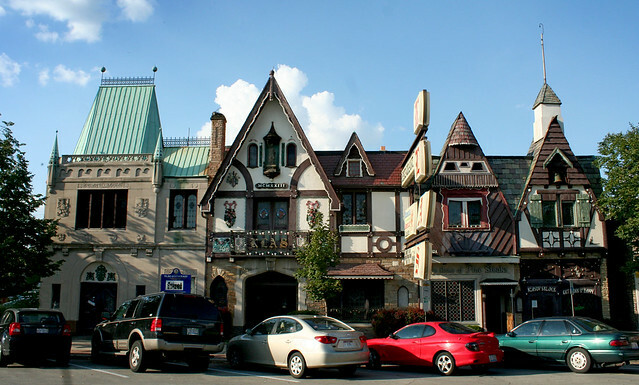 The restaurant was built in at least three stages, visible in the three distinct facades along the street, as well as in the parapet walls separating each section through the length of the building. The eastern-most section appears to have come first, appearing by itself in an early black and white postcard photo. All three sections were completed by 1954, when they appear in a Chicago Tribune ad. The front facade is a riot of architectural detail, overwhelming in its volume, which makes the exterior a treat to visit time and again. 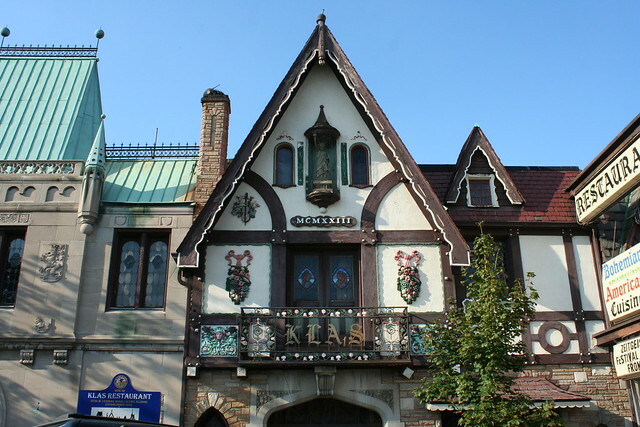 The westernmost section, rendered in smooth gray limestone with steep copper roofing, takes its cues from the grand civic architecture of Prague, folded down to the scale of a neighborhood funeral chapel; the other two sections are both variations on medieval German house styles, embellished with every Eastern European trope imaginable – from faux half-timber and plasterwork to elaborate battenboard trim, and lots of sculpted detailing tacked on – including a little bronze Statue of Liberty in the niche of the central gable as a tip-of-the-hat to the new country. It’s not all Ye Olden Style, however; steel beams support a massive vertical sign with plastic backlit components spelling out the restaurant’s name and mission. There have been some minor changes since this circa-1950s postcard view was taken. The little cupola at right, once a bell tower and later a clock tower, is now blank. A few bits of trim have vanished, and some of the colors have become more muted. The copper roof, seemingly new in the postcard view, has gained the green patina of age. The woodwork needs a new coat of paint. But overall, the place is remarkably intact. 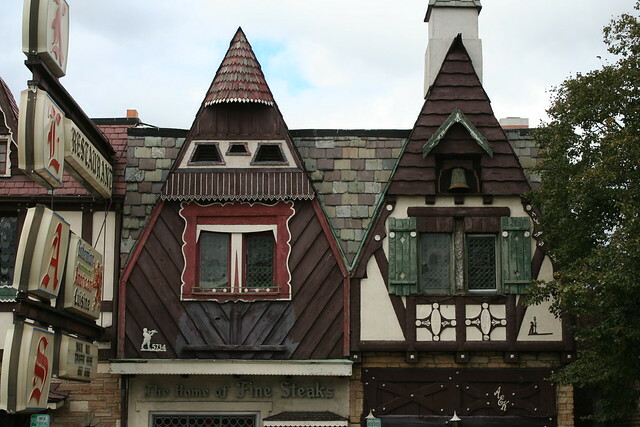 I have never had the good fortune to venture within, but the interior is reportedly tricked out to match, with heavy woodwork that’s a reflection of the heavy food served there. 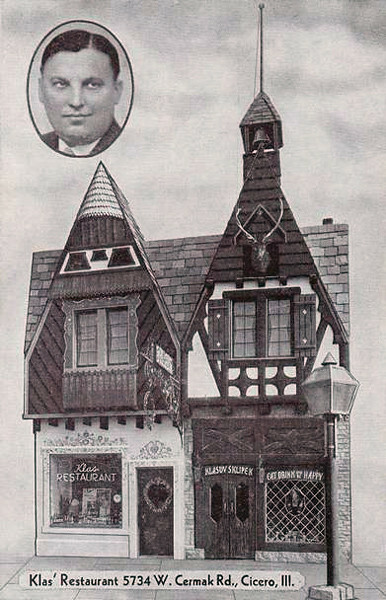 I offer up instead a couple of vintage postcard views, featuring Mr. Klas himself in an inset. Klas Restaurant is open for lunch and dinner on Fridays, Saturdays and Sundays, with the bar only open on Wednesdays. 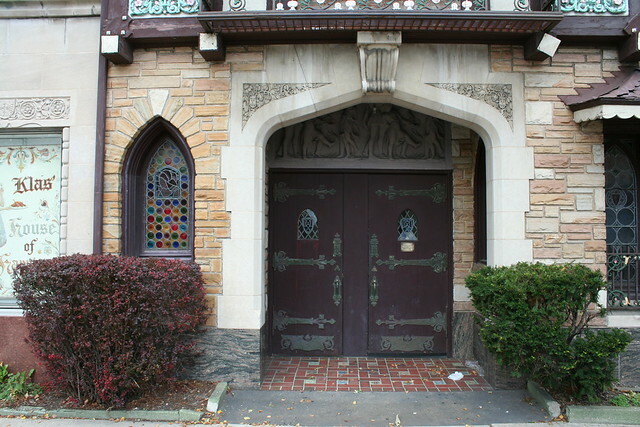 This entry was posted in Cermak Road, Period Revival Styles, Pre-War Commercial Buildings. Bookmark the permalink. Great post, as always. I have been inside, and the interior is quite as fascinating as the exterior. The food, on the other hand….